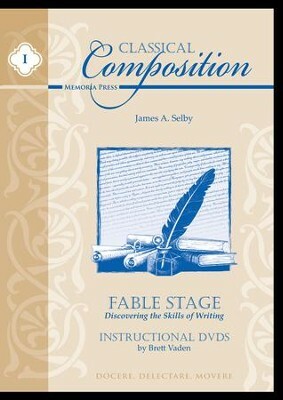 This set of instructional DVDs is part of the Classical Composition series from Memoria Press, and is designed to be used with the Classical Composition I: Fable Stage curriculum (sold-separately). Lessons are divided into the sections given in the book for easy menu navigation. Teacher Brett Varden teaches the lesson in front of a background, with cuts to typed exercises (e.g. an outline being filled out) shown as necessary. 4 discs included. Slightly Imperfect. I'm the author/artist and I want to review Classical Composition I: Fable Stage DVD - Slightly Imperfect.